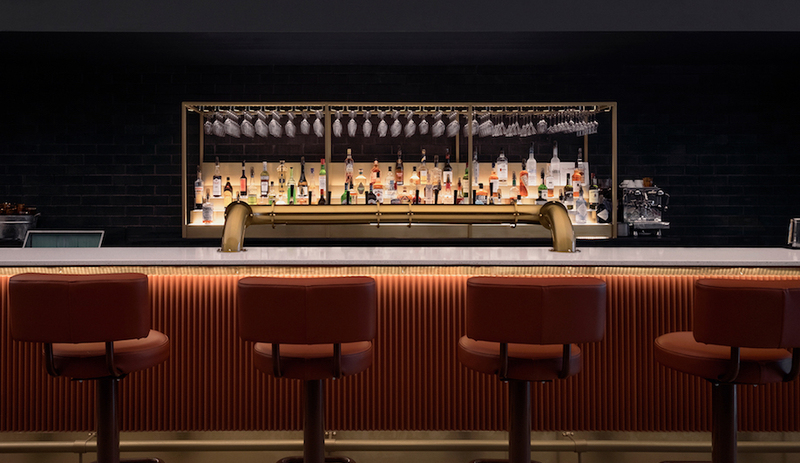 The rise of craft breweries and distilleries has resulted in hybrid environments that merge production and hospitality spaces – often to stunning effect. 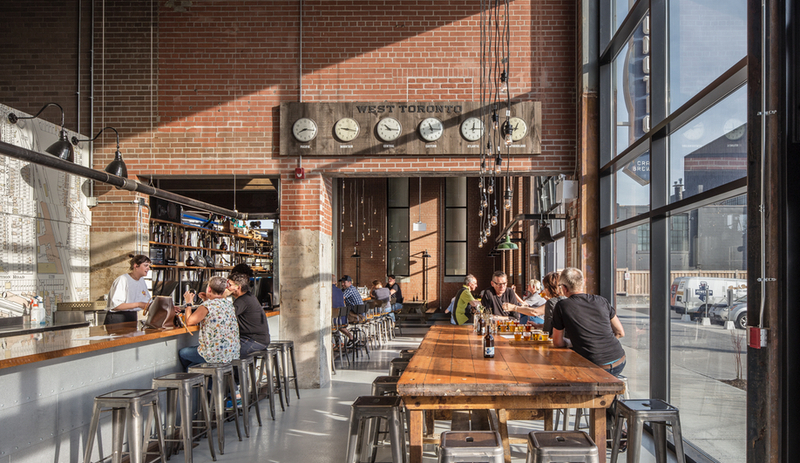 Here, we celebrate four modern takes on the contemporary brewery and distillery, from Toronto to Istanbul. Big Booze has reason to be afraid. Within the last decade, corporate alcohol brands have lost their international grip on the market, with craft breweries and distilleries making a major leap forward: in the U.S., craft beer has become a $26 billion industry. U.S. craft distilleries, for their part, grew by 26 per cent in 2017. It’s a sign that our palettes – whether for salty Goses or elderflower-infused bitters – are evolving. And for the better. The rise of craft boozemakers has also resulted in hybrid hospitality spaces, ones that balance production facilities with taprooms, brewpubs, retail areas and restaurants. Here are a few of our favourites. As craft breweries go, industrial conversions are rather common. But Plant Architect Inc.‘s approach to adaptive reuse for Toronto’s Junction Craft Brewing is especially thoughtful. 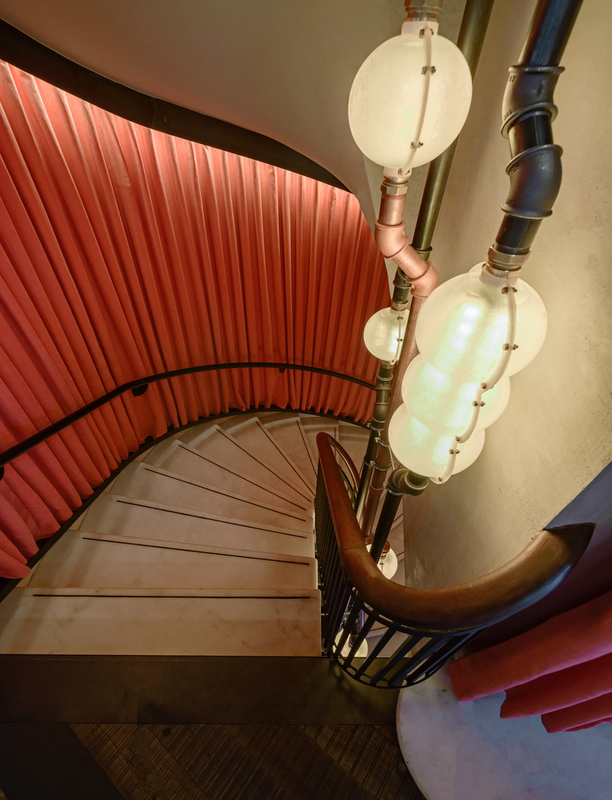 Located in a former incinerator and waste transfer facility – named, quite ominously, the Symes Road Destructor – the revitalization maintained the building’s Art Deco exterior and the industrial markings of its interior. Along with the brewery, the building also contains space for retail, offices and The Symes, another event venue. Plant preserved the openings in the building – note the skylight above – as well as the tall deco windows and skyscraper bottle chandeliers. 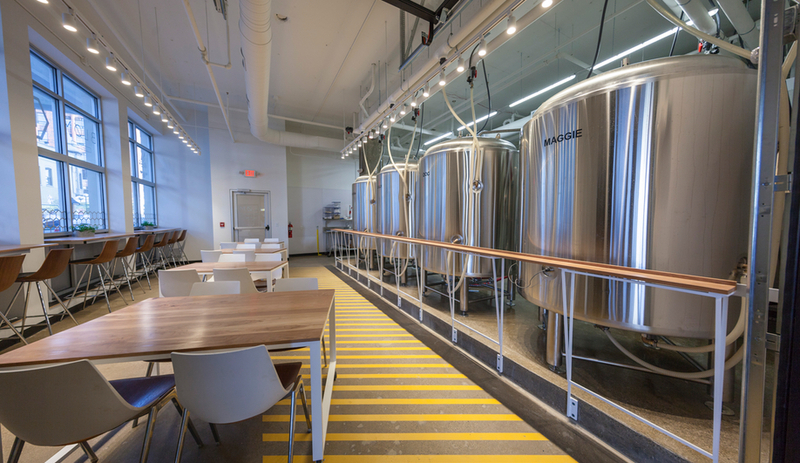 Brewing tanks loom over the the event and seating areas, while fermentation tanks and office space is contained on a second-storey mezzanine. 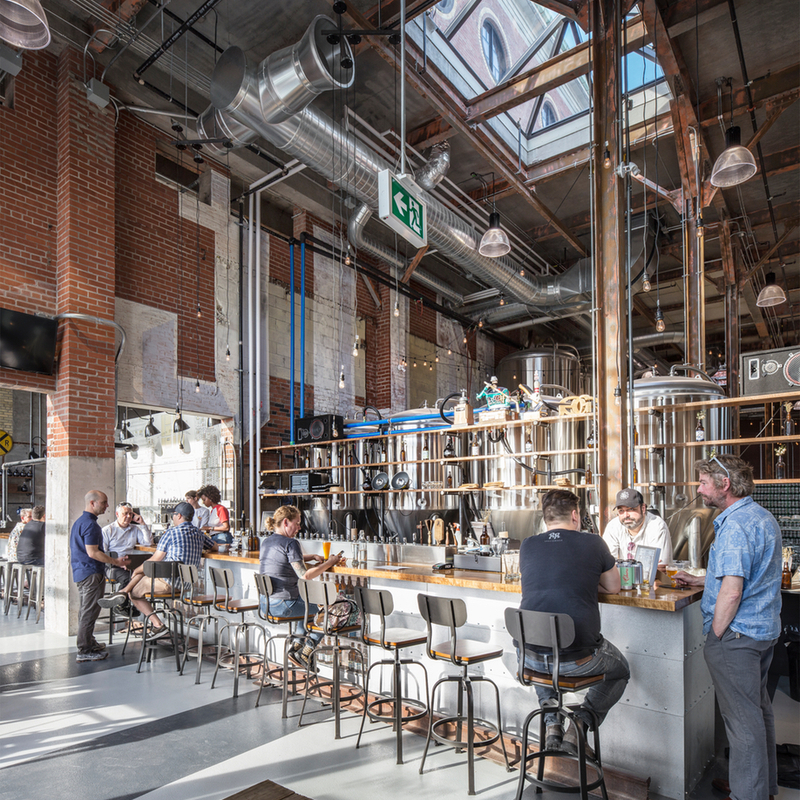 It’s a brewery that squarely pulls its site’s industrial bones to the fore, and for its efforts, Plant was awarded the Architectural Conservancy of Ontario’s Paul Oberman Award for Adaptive Reuse earlier this year. This project, by PLY Architecture and Synecdoche Design Studio, pairs a refined industrial aesthetic with bold graphic elements. 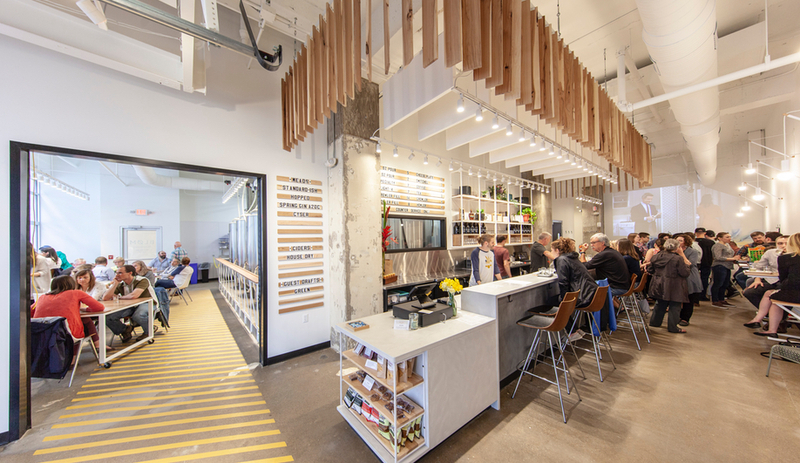 A bright yellow path, painted on the meadery’s polished concrete floors, initially leads visitors to a bar serving Bløm Meadworks‘ sessionable mead, featuring a custom-made concrete bar sitting beneath a soffit made from hickory-wood slats. 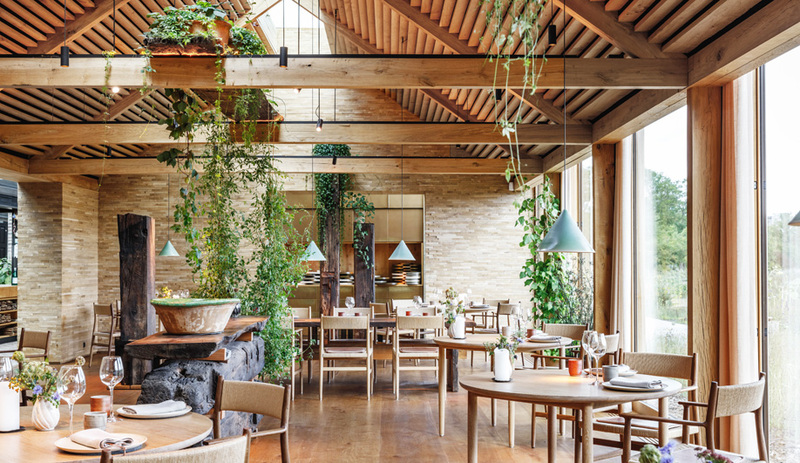 Those slats were sourced from owner Lauren Bloom’s family farm, and pair with Sound Silencer PEPP acoustic panels to form an eye-catching feature. The yellow path further guides visitors through a transparent garage door into The Workshop, where polished steel fermentation tanks are on full display. 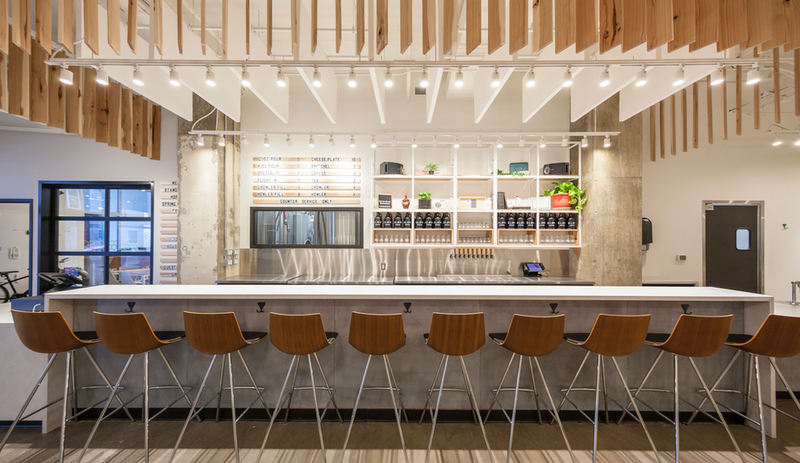 Far from being a simple production facility, this area features custom-made tables (featuring, again, wood sourced from Bloom’s family farm) to accommodate overflow seating. The space is tastefully restrained, which directs users to the star of the show: mead, an ancient drink whose roots stretch back to 7,000 B.C. 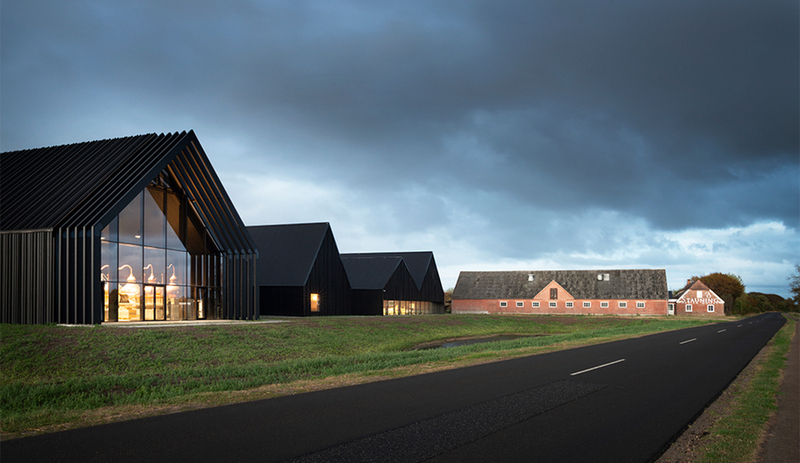 Though Skjern, Denmark’s Stauning Whisky doesn’t exactly offer a hospitality environment, its guided tours have become a tourist attraction – largely due to the beauty of the production facility, care of LOOP Architects. 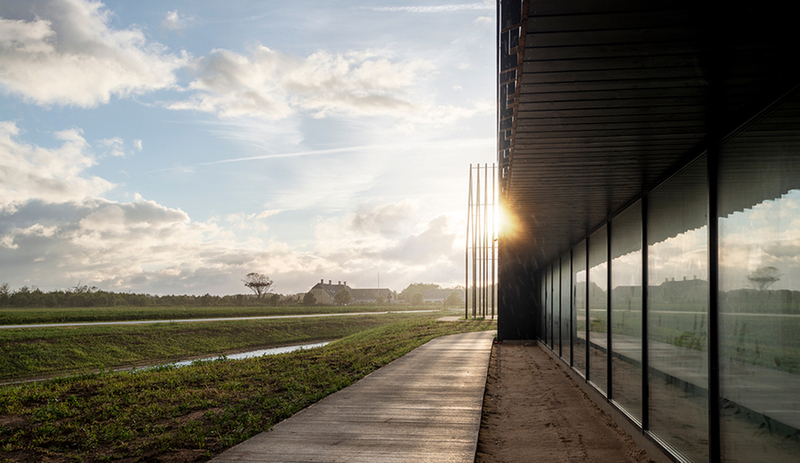 Spread across six buildings, the facility nods to traditional Danish rural typologies, namely barns and fishing huts. Each building is constructed from wood, which is either painted black or charred using Japanese Shou Sugi Ban techniques, giving the structures a monolithic appearance that, in places, is interrupted by steel gables. 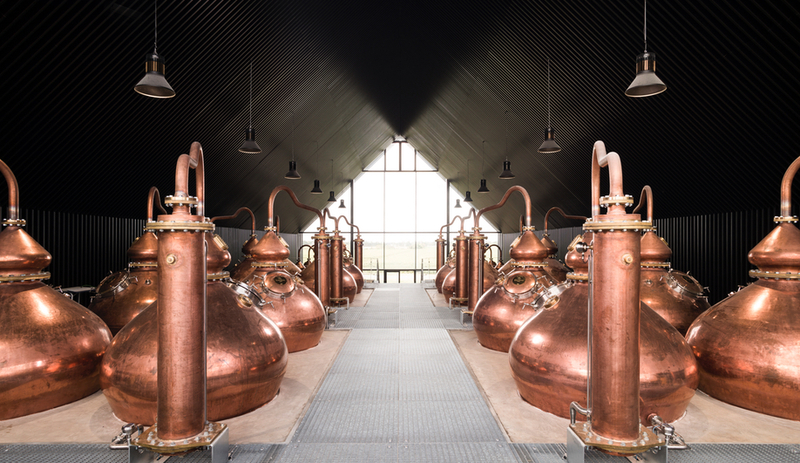 Each of the six buildings serves a distinct purpose: two are reserved for malt maturation; another features massive ovens; whisky is then moved to fermentation tanks; and finally, the product is moved to a structure with copper pot stills (above). The final building is dedicated to aging, and contains a series of wooden casks. 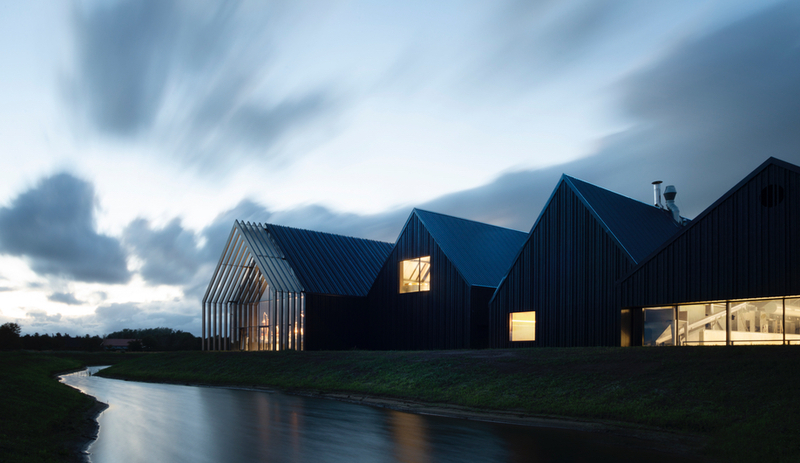 The streamlined aesthetic of Stauning Whisky’s exteriors are replicated inside each of the buildings: ventilation pipes, for example, are hidden behind slatted wood ceilings, which also provide acoustic dampening. In Istanbul, quirky local firm Lagranja Design was commissioned to design a brewery for The Populist, one of the city’s oldest and best-loved craft brewers. 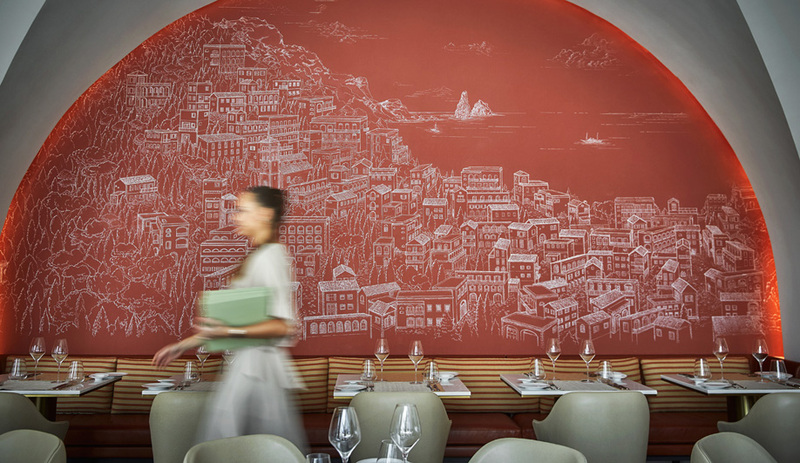 That space would become a sensation in the Turkish capital – such a sensation, in fact, that the beer brand approached Lagranja to design a second location in the tony Bebek neighbourhood. And while it isn’t actually a brewery – suds are supplied by The Populist’s first location – the firm created a playful site-wide installation that gestures to the act of beer-making. They named it, quite aptly, the Beer Dream Machine. 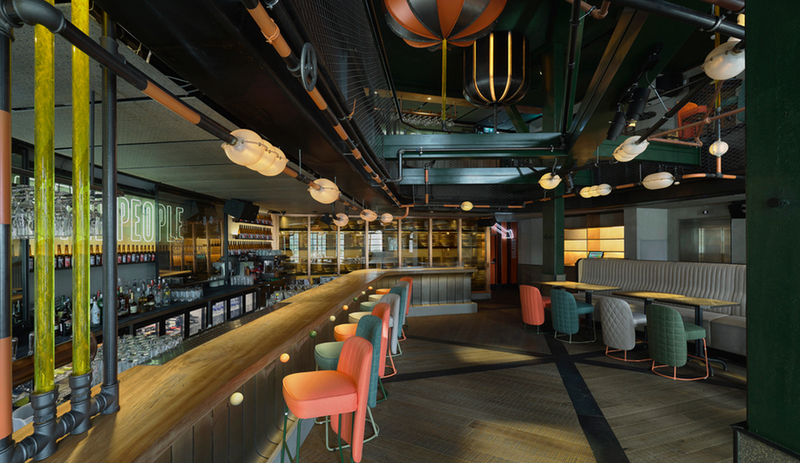 Almost everything, from the bar’s colourful stools to neon signs that reference prohibition-era Istanbul, were custom-designed. 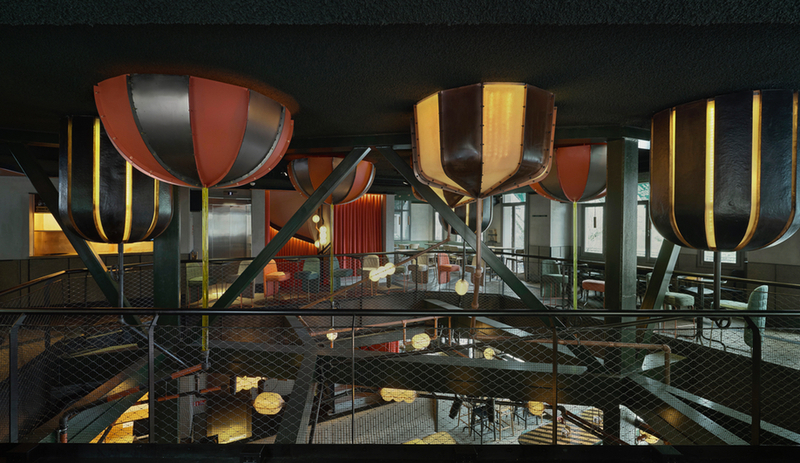 But the central feature of The Populist Bebek are ceiling-mounted sculptural objects connected by metal pipes that reference brewing tanks. The design studio developed a second-storey mezzanine that wraps around these installations – which also serve as lighting and which seem to “dance following the rhythm of the music playing in the brewery.” It’s an abstract celebration of beer, but trust us: the beer served onsite is very real.